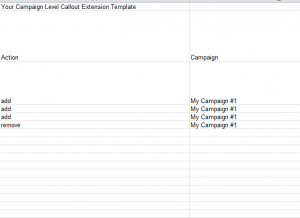 If you need to add additional descriptive text to your dynamic ad, the Campaign Level Callout Extensions Template will let you include additional descriptive information in your standard ad. Maybe you’d like to point out the fact that the shoes you sell on your site are made with an eco-friendly material. This is something you can list in your callout extension for your product or service to target customers that are looking for that quality in a business. Start by listing the he Action you want to take in column A. This is where you can specify if you want to add or remove one of your extensions. Next, you’ll need to choose the campaign you’ll add, remove, or edit your extension in. Simply write the name of your AdWords campaign in this section. You will do the same in column C to specify which of your ad groups within that campaign you want to use this extension for. Now for the most important part of your document, you need to enter the actual text that will be included in your ad. Using the earlier example of a business owner that wants to point out the fact that their shoes are made with an eco-friendly material, you can write something along the lines of “Eco-Friendly Material”. There are a few constraints, however, when choosing your callout text. There is a limit of 25 characters so remember to keep it short, concise, and straight to the point. You will upload this document to your AdWords campaign. Simply follow the instructions to upload your document in AdWords. After you have submitted your information the ad will go through an approval process and you will receive confirmation when it gets accepted or denied.